The surround audio has become a standard entertainment sound system for home theatre experience. With time, it has been made better and offers far more immersive audio perception than the two-channel ones. If you have decided to buy the 5.1 system, you will find this post super useful. Here is a list of top best 5.1 sound systems. Most buyers have a very strong opinion that you should spend hundreds of dollars to set up your own home theatre system. 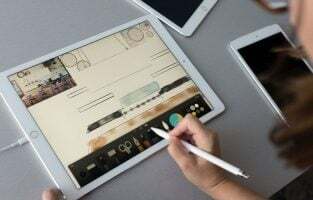 While it is true for bigger brands and for products that have more advanced customization features, the average music lover may not have to spend a small fortune to enjoy their favourite movie or music. The Acoustic Audio AA5170 is the best example as it offers everything you need with additional perks and will allow you to enjoy your favourite sounds in a very immersive setup. The speakers are excellent in terms of design and build quality. The black, glossy finish will let you pair it up with most televisions or computer monitors. The product is available in other colours too, but the one with the black, orange finish is pleasing to the eyes. It is capable of delivering 700 watts of power, loud enough for most home applications. The frequency range is measured between 20 Hz and 20 kHz. Some of the additional features found in the sound system sound not only impressive but will also come in handy when you want to listen to something new. It has an FM tuner so that you can listen to your local station; supports Bluetooth to stream songs directly from your smartphone or tablet and there is also an SD card slot to save personal collections as MP3 files to stream them in a 5.1 system. The product comes with a 3.5 mm to RCA cable so that you don’t have to fumble to connect it to your television. 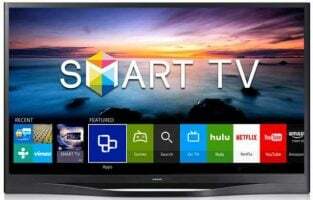 It should easily work even with older televisions and gets the job done without using a dedicated A/V receiver as found in most home theatre systems. What Makes the Acoustic Audio AA5170 a Great 5.1 Sound System? Bose is a household name among audiophiles or at least among those who are keen on setting up their own home theatre. The company excels at making some of the best speakers that are compact, easy to install and are capable of delivering impeccable sound quality. The brand easily makes to the top of the list which has some other known brands like Yamaha, Onkyoand Denon. The Acoustimass 10 Series is specially designed to cover large rooms while maintaining the best acoustic levels. The speakers are redesigned in such a way that they look compact, has a great sound throw and can easily be mounted on the wall. It provides a sophisticated design and the Reflecting Series II speakers are responsible for the fine balance in treble and bass that you hear when playing movies, music or playing video games. It is equipped with two individual high-performance drivers. The 5.1 speaker system from Bose has dedicated controls to adjust the volume as well as the low-frequency effects. 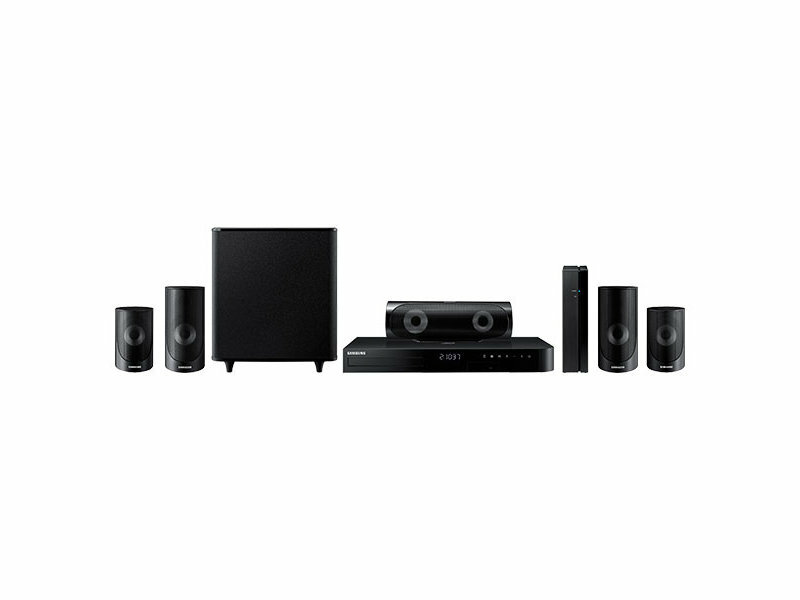 The Bose Acoustimass 10 Series V home theatre is easy to set up as all the cables are marked. It is capable of delivering up to 200 watts per channel and with five speakers to deliver sound combined with a dedicated sub-woofer system, the end output is rather fantastic with crisp vocals, treble and deep, booming bass. The overall power is rated at 8 ohms per channel which leads to a combined sound output of more than 40 ohms. What Makes Bose Acoustimass 10 Series Ideal for Serious Audiophiles? The Logitech Z906 is an award-winning product that has been continuously winning medals for delivering excellent sound, impressive build quality and delivering a complete experience in a very budget-friendly price tag. While Logitech is a brand that is mostly associated with computers, you can still make use of the 5.1 surround sound system in television if you like to. For everyone else who already have a laptop or a grand desktop setup, they can comfortably choose the Z906 for a supra-aural experience without breaking the bank. The system is capable of delivering 500 watts of power when combined and when you pair it with the sub-woofer, it can go all the way up to 1000 watts. The booming bass is something that will feel excellent when watching movies or playing games like Call of Duty where there will be lots of gun sound to take into account. The sound system excels as it supports all major sound formats including THX, DTS and Dolby Digital. You couldn’t ask for more as it does everything for a price that is less than $300. 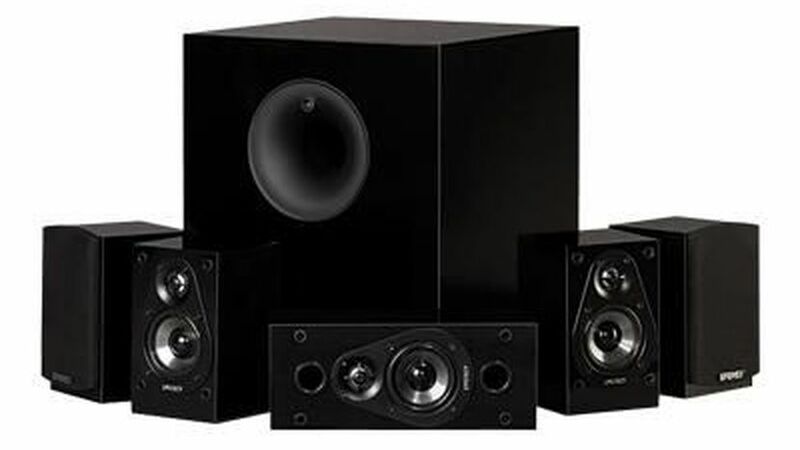 The speakers deliver great value for money and can be used with a wide range of setups, including computers, televisions, music players and gaming consoles. It has a central hub with analog volume control, a dedicated remote to adjust treble, bass among other sound features. The bundle includes RCA cable, has multiple inputs including coaxial input and optical input. 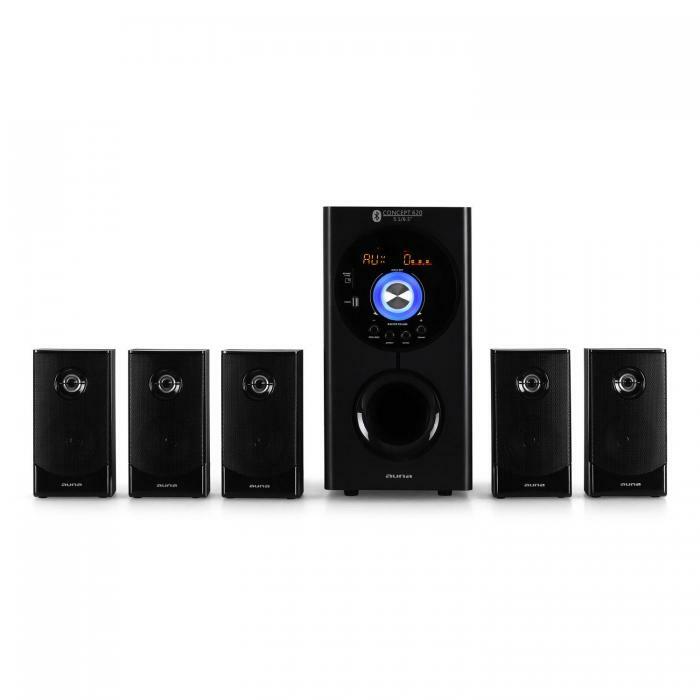 The satellite speakers are wall mountable and up to six devices can be connected to the Logitech 5.1 surround system at the same time. 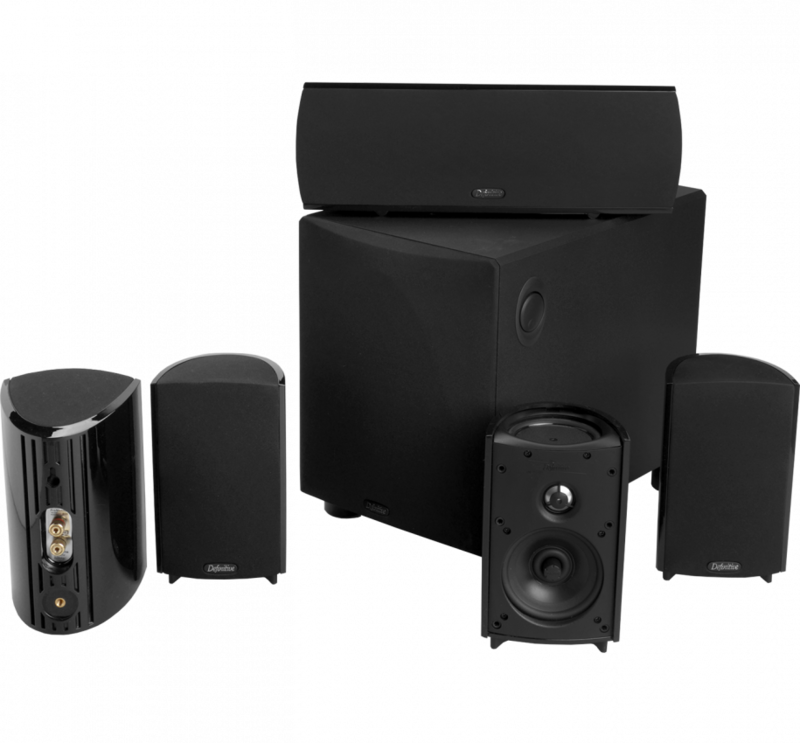 What Makes the Logitech Z906 an Excellent 5.1 Surround Sound System? JBL is a professional audio equipment manufacturer and you may or may not know the fact that they are one of the leading suppliers of speakers for music concerts. The company specializes more in professional equipment but that doesn’t stop from taking a plunge into the consumer market. They already have an excellent lineup of Bluetooth speakers, acoustic speakers and the Leviton AEH50-WH is powered by JBL. It provides the company with the brand recognition it needs and assures the quality it is capable of delivering. The 5-channel surround sound system ditches the highly conventional black finish. Instead, the manufacturer has gone for a pure white design which is unique and if you already have a room with white wall colors, this will perfectly blend in the scenario. The speakers are rather large measured at 8-inches and the included sub-woofer produces up to 100 watts. It is more than capable of creating the boomy bass that you would expect when watching action movies and listening to thumping music on Spotify or Apple Music. The small speakers can be wall mounted as they have mounting brackets in the rear end and they are coated with video magnetic shields. It safeguards your television against any distortion caused by the speaker’s magnetic waves. The speakers are directly connected to the AV Receiver for maximum sound quality and output. The woofer is large in size, has good ground clearance and should provide excellent bass quality, while the speakers combined with the integrated tweeters will deliver impressive treble. The combination leads to a wholesome 5.1 sound system experience. What makes the Leviton AEH50-AH a Great Surround System? The home theatre setup arena has been a very expensive affair because if you are looking for features like Dolby Atmos or THX, the setup will be more elaborate and could cost a lot. However, not everyone wants to invest hundreds of dollars. If you are among this lot, looking for a quick way to have a multi-speaker system that can easily split sounds in all directions but don’t need an AV receiver or complex placement, this is the one. Being a cheaper solution will allow many buyers to buy more than one product at the same time and use it for different rooms in their home. 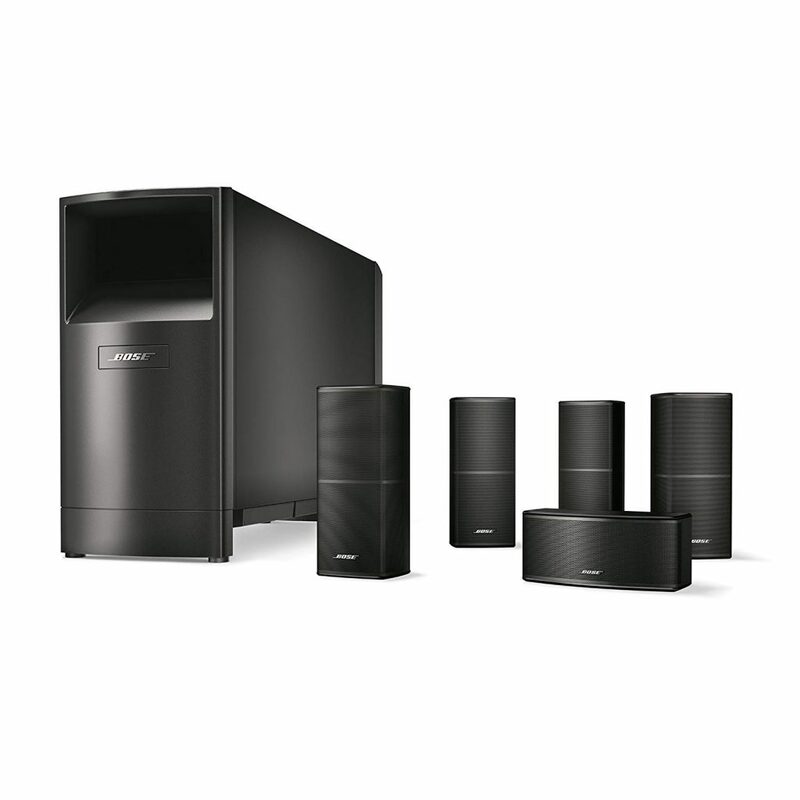 The Monoprice 108247 is a 5.1 home theatre system which is capable of splitting sound automatically. It has two rear speakers, two front speakers and one centre speaker to bring dialogs and voices from the movie to the forefront. The system includes a large 8-inch speaker capable of delivering up to 60 watts. It is usually more than enough for most small to medium-sized rooms. As home theatre systems are placed in bedrooms or a dedicated place, you can make the most out of this one considering how cheap it is. The monoprice model is rated to have 125 watts of power, capable of delivering high volumes for movies, music and gaming. You can even consider using it as a spare speaker and make use of all five 8 ohms speakers which produce great music quality when combined together. The surround system will not support technologies like Atmos or THX, because it doesn’t use any centralized system but it does a lot for the price and will provide you an experience like the theatres. 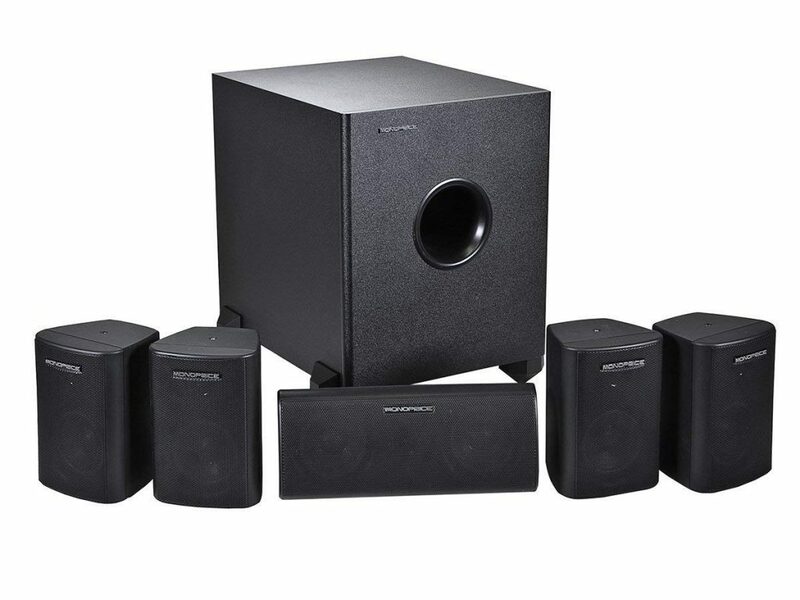 What Makes the Monoprice 108247 a Great Budget 5.1 Sound System? Onkyo has been in the music industry for a very long time and they make some of the best speaker systems that you can think of. While some companies focus on making both headphones and speakers, Onkyo specializes in the latter making them a reliable brand when it comes to delivering excellent sound quality. The build quality of the Onkyo SKS-HT690 is the first thing that you will notice in the 5.1 surround system. The company also excels at creating products that are capable of delivering a more neutral sound rather than focusing solely on the bass or treble aspect. The product can easily win some of the best awards both for its musical fidelity and the overall design. The Onkyo sound system uses a powerful sub-woofer system. The manufacturer promotes it as the best aspect of the bundle as it delivers 120 watts bass reflex. The speakers are rather large and the woofer is about 10-inches making it capable of producing the booming sounds that you would expect. It is an exhilarating experience when watching movies or listening to music. You can even play games by connecting your console to the sound system. The SKS model from Onkyo delivers sound between 25 Hz to 150 Hz with a nominal impedance measured at 4 ohms. The speakers are magnetically shielded so that you can comfortably keep them near your television without any waves affecting the picture being displayed. They use a high gloss 2-way acoustic suspension making it simpler to mount the front and the centre speaker. 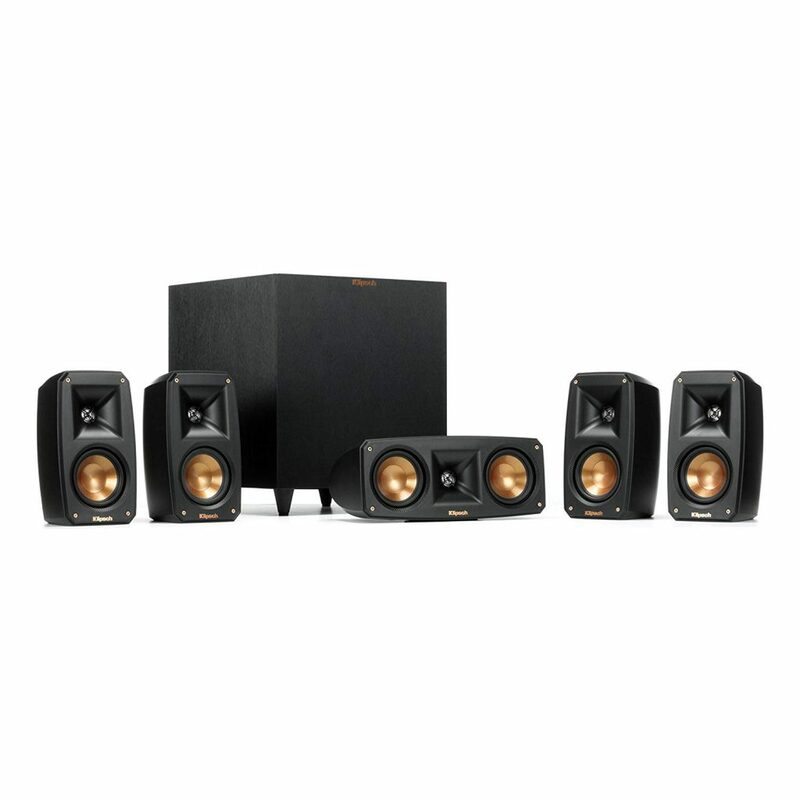 They are capable of providing the surround sound experience you would expect from a 5.1 setup with an excellent centre speaker that produces authentic voice frequencies. What Makes the Onkyo SKS-HT690 One of the Best 5.1 Sound Systems? 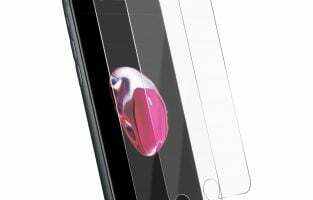 The world of music has drastically changed and is expected to change even further, because smartphones have already removed the legacy 3.5 mm jack. The soundbars are now being predominantly used in homes where people don’t want to set up multiple speakers on all corners and experience the convenience of wireless rear speakers. While wires are more reliable, the consumer crowd is not interested in it. 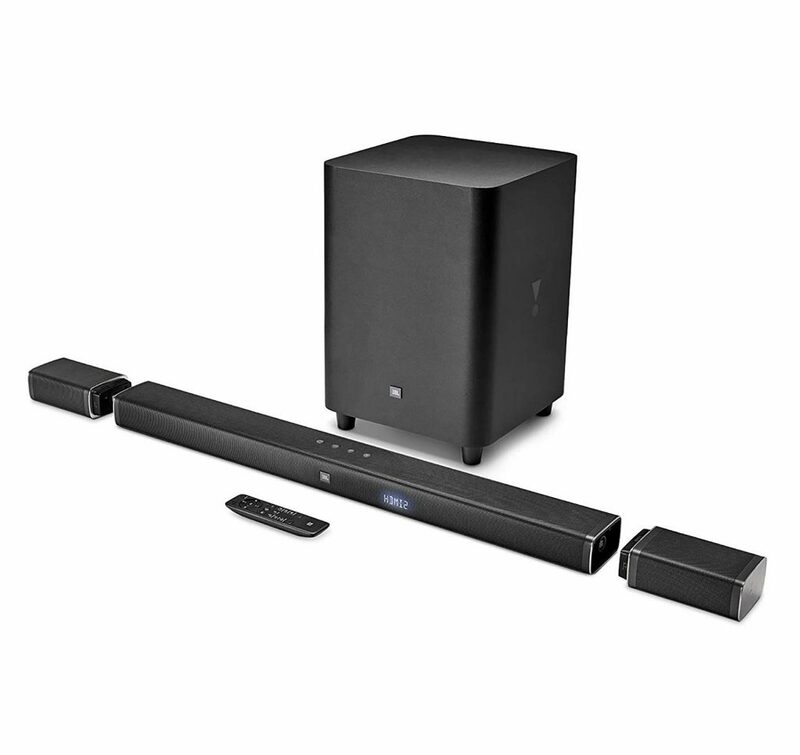 The JBL Bar ideally satisfies this requirement with a 5.1 soundbar and wireless speakers. Traditionally, soundbars are considered to be used for throwing better sound but not for a surround sound experience. The JBL bar inherits a 5.1 setup which makes it easier for you to mount, create a sound experience that is on par with dedicated systems and also has great aesthetics that many users care about. Surprisingly, the subtle looking speakers are capable of supporting some of the popular sound formats including Dolby Digital, DTS and also Pro Logic II. It gives it a winning advantage in terms of pricing and a compact finish. The JBL bar comes bundled with a large 10-inch subwoofer and the innovative part is that it is completely wireless. You can easily store it in any part of the room, in the corner or wherever the sound aesthetics are the best. A total of 150 watts of power are rendered by the 5.1 sound system which also uses two wireless surround speakers. You can place it behind your couch to get immersive sound, but without having to put up with intrusive wires. It has three HDMI ports and even supports 4K connectivity to enjoy the sound and video outputs in UHD resolution. What Makes the JBL 5.1 Channel Soundbar Excellent? The brand Klipsch is a famous one among serious audiophiles who might have already tried their speakers and their entire range of in-ear headphones. While the average consumer may or may not have heard about it, you can absolutely check this one out, as it is designed to deliver a sound system like no other. The package is quite stylish which adds up to the overall experience and you can comfortably leave it along with your home theater setup. If you are looking for an amazing treble, this product delivers, as it is equipped with the Tractrix Horn technology and uses aluminium tweeters for sound reproduction. They are capable of producing the most natural sound which is unique, brings movies and music to life rather than adding an artificial sound signature. The sub-woofer is rather large but it seamlessly blends with the copper-coloured speakers and it uses down-firing technology to add an additional oomph factor to the bass. The advantage of having down-firing woofers is that it makes it easier to set up in a smaller room and still get the right acoustic. The satellite speakers have mounts in them which will make it easier for you to wall mount them if required. A surprising addition is that the woofer is wireless and can be placed in any corner of the room without long wires passing through. The overall design and shape of the Klipsch 5.1 speaker system are what makes it an excellent addition to any kind of home theater setup. 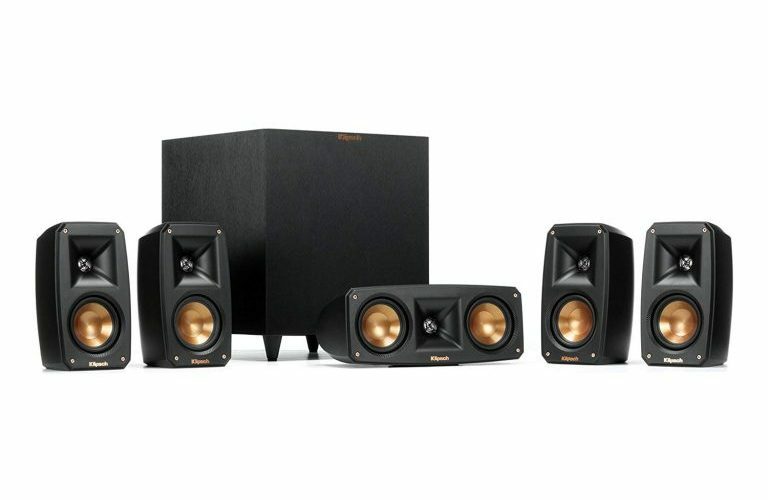 What Makes the Klipsch 5.1 Sound System the Best? This is a 6 piece home theatre system from Definitive Technology. There is a ProCentre 1000 center loudspeaker, 4 satellite ProMonitor 800 speakers and a ProSub 800 subwoofer. The sound played through this sound system has the body and warmth of musical instruments and the voices, thanks to the BDSS technology driver which doubles the lower mid-range area of the speaker that radiates without the need of a bigger enclosure. The main attraction is its center channel which happens to produce life-like sound effects. There are two mid/bass radiators on the side of the enclosure so you can play loud music clearly. The subwoofer has a 300-watt amplifier which drives an 8-inch woofer pressure coupled to a low bass radiator of 8 inches featured below the enclosure. It is much better than a single 10-inch woofer. It offers better control, speed and pitch definition. The sound this system delivers is incredible and it is one of the most dynamic 5.1 sound system’s to own. 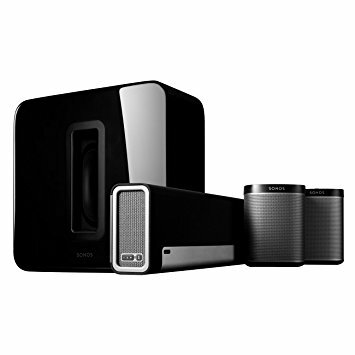 The home theatre from Sonos is a smart surround system. You can give voice commands to the wireless smart speaker – Alexa takes all the commands. There are two Sonos voice-controlled wireless speakers, one wireless subwoofer and a PLAYBAR TV soundbar including the package. Complimenting HD television screens this amazing sound system from Sonos delivers powerful and clear sound through nine amplified drivers. You can also stream music wirelessly. Add more Sonos speakers to other rooms and wirelessly connect them. You can now enjoy crystal clear sound in every room – perfect for parties. It adds deeper bass to any Sonos wireless speaker, so you can enjoy loud music. This is one of the best 5.1 sound systems on the list. The HT-S7800 flagship magnifies noise-free sound along with high-current power for dynamic speaker control – thus producing rich and clear sound. The Dolby Atmos-enabled height speakers to reflect the distinct sound effects to your listening space. Two audio speakers that come with this package can be placed in a second room through a receiver. The sound of this home theatre system is remarkable. It offers extraordinary clear sound. Also included is the DTS X which features height channels for an immersive listening experience. There are some amazing things you can do such as turn up the dialogue only in a mix. It is HDCP 2.2 and HDMI compatible so all the formats released are compatible with it. You get a bandwidth of 18Gbps which supports 4:4:4 color space and 2160 pixels for a much clearer vision than 1080 pixels. 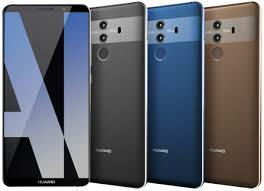 It also transmits HDR formats with BT.2020 support offering clear pictures of highest quality. All the 1080 pixels videos are upscaled into 4K Ultra HD. The Onkyo home theatre also offers Wi-Fi and Bluetooth so you can enjoy wireless music through smartphones or laptop. Pandora, Spotify, and TuneIn can be accessed through the Onkyo remote. The Yamaha sound system offers high-quality sound. There is an 8-inch 100-watt subwoofer included for a rich and strong bass. The subwoofer betters the quality of the sound when the volume is increased. 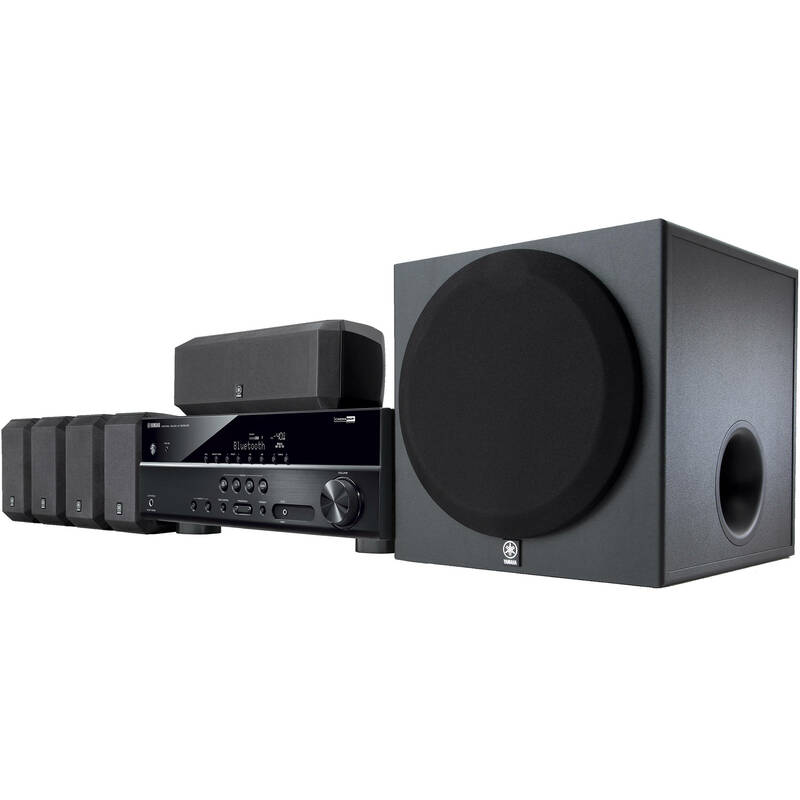 Four surround speakers along with a center channel are easy to mount and are perfect for music and movies. You can play music wirelessly through your smartphones, tablets or laptops because this flagship from Yamaha is equipped with Bluetooth. The compressed music enhancer has been optimized for Bluetooth audio transmissions so you can experience lively and rich music while you play wirelessly. The YPAO system included in this sound system automatically calibrates the environment and delivers optimal sound. The Samsung 5.1 sound system includes two wireless rear speakers, two front speakers, one center channel speaker and a passive subwoofer. With this set-up, you can experience immersive audio. The built-in Wi-Fi lets you stream online content and gives you access to games and apps. You can sync and share multimedia and television content through your smartphones or laptops. 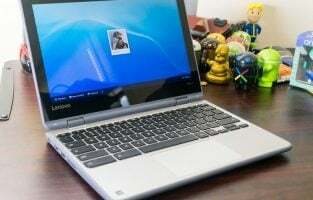 You also get Blue-ray functionality so you can access websites and even play games, you just need to be connected to the internet. Any Bluetooth enabled device such as your tablets, smartphones, computers or laptops can also be connected to this sound system and you can wirelessly stream audios. The 3D Blu-ray included in this system upscales all video content to HD and lets you enjoy all old shows and movies in HD quality. The clear sound is credited to Dolby Digital Plus. It processes two-channel audio and delivers the best surround sound. You can hear loud music without any crackles or noises. 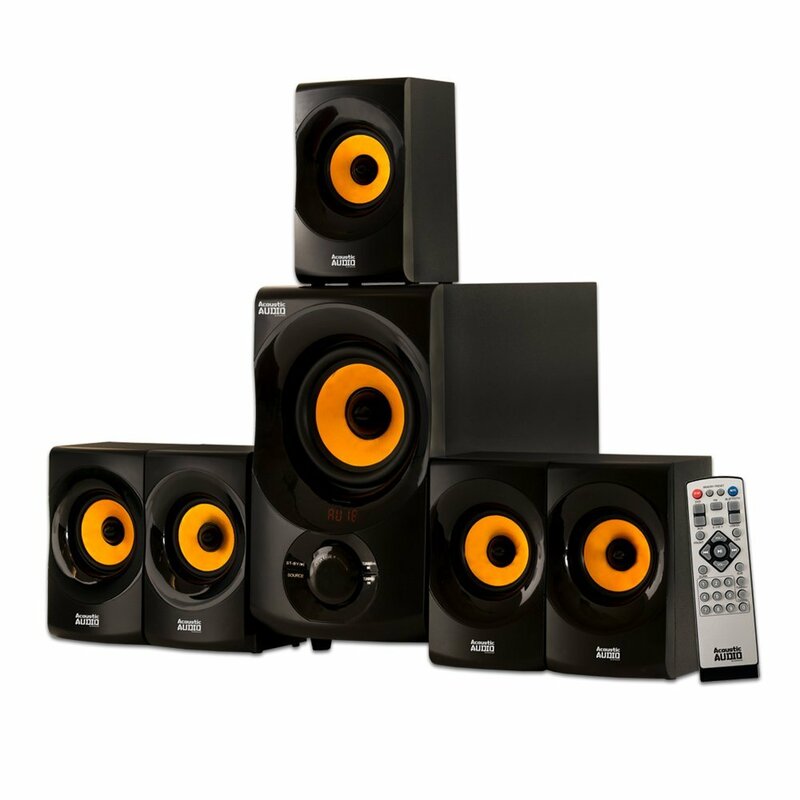 For those who are looking for a budgeted sound system, this sound system from Energy is a perfect take. The company hasn’t compromised in the quality or performance of this gorgeous sound system. There are integrated keyhole mounts, rubber bumpers and the inserts are threaded so you can select where to place the speakers. There are four satellite speakers, one 200 watt subwoofer and a center channel speaker from Take. Every speaker component delivers clear sound and loud music. The music is delivered uniformly in all directions from the speakers and no frequency is dominated by the other making it sound natural and lively. What’s more, the speakers are resonance and distortion free. The ribbed elliptical surround technology gets rid of any distortion and increases the efficiency of the subwoofer and woofers. The technology of the Energy woofers has been made to move lots of air within so they can play low frequencies with more bass. 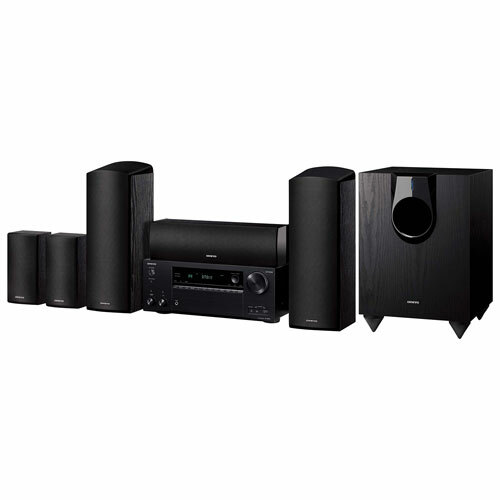 This is another budgeted 5.1 sound system which offers quality music at a great price. The Auna surround sound offers compact satellite speakers that come with a black casing. 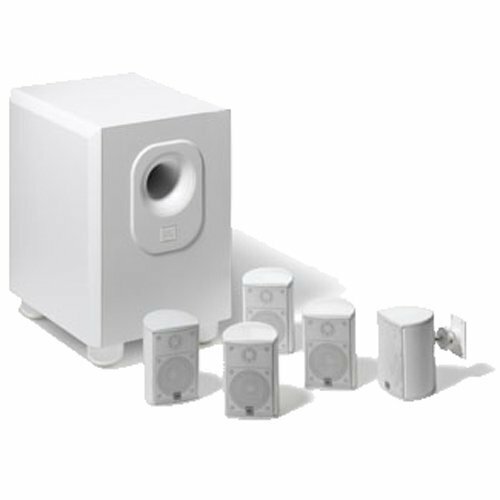 These speakers can easily be set on the floor because it features non-slipper pedestals. There are five satellite speakers and one main subwoofer in the package. You can use memory sticks or SD/MMC memory card slots to play music. The sound system also offers an AM/FM radio tuner with a LED display. The above is the list of some top best 5.1 sound systems 2019. All of these deliver top-quality sound and offer an exceptional experience.